In the first day of the Baltic Cup 2015, tournament guests from Lithuania and Latvia took the court at the Parnu Sports Hall. 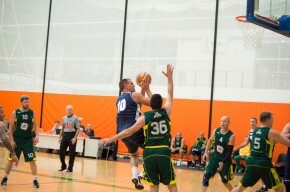 It proved to be a better day for Lithuanian veterans, as their teams won all five games played on Friday. Estonian teams will join the competition on Saturday, playing against both Lithuanian and Latvian opponents. In the first game of the day, Vilniaus Statybos Senjorai snatched a 52-35 victory against Tukums in the M65 age category. Led by Eduardas Kairys, who had 14 points and five rebounds, the Lithuanians broke away in the second quarter and were in front for the remainder of the game. In addition to an excellent performance by Kairys, Rimvydas Aukstuolis added 11 points and six rebounds, while Romas Ramanauskas chipped in with eight points and 10 boards. For Tukums, Konstantins Rozins had a team-high nine points. 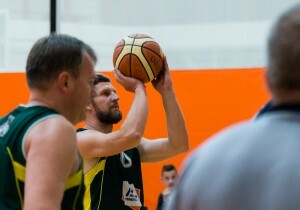 Salilita also began the tournament with a win, easing past Kekava 68-35 in the M55 age category, behind 27 points and nine rebounds from Vladas Luksa. Steponas Jokubauskas scored 15 points, while former Olympic discus throw gold medalist Romas Ubartas added eight points and 16 rebounds. Konstantins Antasovs and Valdis Berzins had 12 points apiece for the losing side. In the M50 age group, Patvanka cruised to a 76-61 victory against Tukums. Arvydas Venclovas had a game-high 29 points, Ramunas Juska scored 14 points, while Romanas Brazdauskis added 13 points and 15 rebounds. Andris Liepins had 27 points for Tukums. Pakruojo Parketas also began the Baltic Cup with a win, getting the better of Kekava and taking a 52-38 win in the M45 age category. Gintaras Staniulis was the leading scorer for the winning side with 15 points, nine rebounds and five assists to his name. Arunas Seferis added 14 points for Pakruojo Parketas, while Heino Aire and Ugis Lasmanis had 10 points each for Kekava. In the closest game of the day, Lithuanian team Alkajas-Dastra topped Corporate Solutions 75-70 after an extremely close battle in the M40 age category. Virginijus Sirvydis had 29 points for the winners, while Egidijus Mikalajunas added 17 points and eight boards. Normunds Freierbergs collected 22 points, seven rebounds and six steals for Corporate Solutions. Baltic Cup 2015 – the first edition of the new project!